THE HOLY GREAL. The Greal Chapel. There are many mysterious places in Wales but none more so than the ancient church of St Peters-super-Montem in Glamorgan. Once it was at a great political centre, close to the walls of the fabled Caer Caradoc–Castle of Caradoc, and just to the east lay a township and trading centre known as Por-tref = The Supreme Town, which today is only visible as a place name on a map and as outlines of buildings and enclosures on infra-red photographs taken from the air above. A lonely and forgotten place. Today, it lies abandoned by man and left to fall into dereliction, the casual visitor could be forgiven for thinking that it is of no consequence. However, our researches and the excavations have proved that this was very far from the case, and this was an ancient church first built in Apostolic times when Christianity arrived in Britain in AD 35- 37. Believing this to be the case as stated in several of our most venerable British records, we, Alan Wilson and Baram Blackett approached the commissioners and for a modest sum we purchased what was left of the building. Had we known what a hornets nest we would be stirring, how much abuse we would have poured on our heads, and how we would be pilloried mercilessly by enemies we didn’t know even existed, we might have been less eager. However, in 1976 we set out on our quest, and in 1981 when we bought the ruin, all this was in the future. In the spirit of the Arthurian quest we were concerned with but one thing, and that was to find out the truth behind the matter. Throughout our 27 years of Researches into Ancient British History we have always sought to deal with British matters as factual actual real history rather than to trivialise our Native British heritage as a collection of irrelevant myths, legends, and folklore. This is not always an easy path to take as the Histories of both Albyne (around 1600 BC) and of Brutus (around 504 BC) are routinely derided as myths by academia, and yet they can be comprehensively shown to be authentic records of real events. This dilemma of differentiating between Historical reality and alleged myth and legend is even greater when confronting The Matter of Britain in the case of the real King Arthurs who are provably Arthur son of the Emperor Magnus Maximus and his direct descendant Arthur son of King Meurig. No history has ever been so totally and persistently abused. generally shunned by academia as being literary inventions. This negative stance is very suitable and it is admirably both politically and religiously correct. The obvious difficulty is that what are dismissed as myths and legends are in a fact stories, which are based upon facts, and it is the facts behind the stories that we must examine. No ancient memory is better known than the tales of The Holy Greal, and the Greal Chapel. We use the original and correct term Greal because it is the Khumric British word and because unlike a ‘grail’ it has meaning. It means a collection of records. The fact is that anyone setting out to discover the location of the Greal Chapel as a real place is automatically dismissed by academia as a fringe researcher, one who is not to be taken seriously. If however there was once a real Greal Chapel and the stories of the Arthurian Sagas are based upon this and other facts, then the search becomes a very serious matter. We have demonstrated beyond all doubt that “King Arthur” was no mythical unreal figure, but instead an amalgam of two mighty British warrior Kings in the persons of Arthur I son of Magnus and Ceindrech, and Arthur II son of Meurig. Therefore as “King Arthur” was a reality why should there not have been a Greal Chapel of The Holy Greal.? 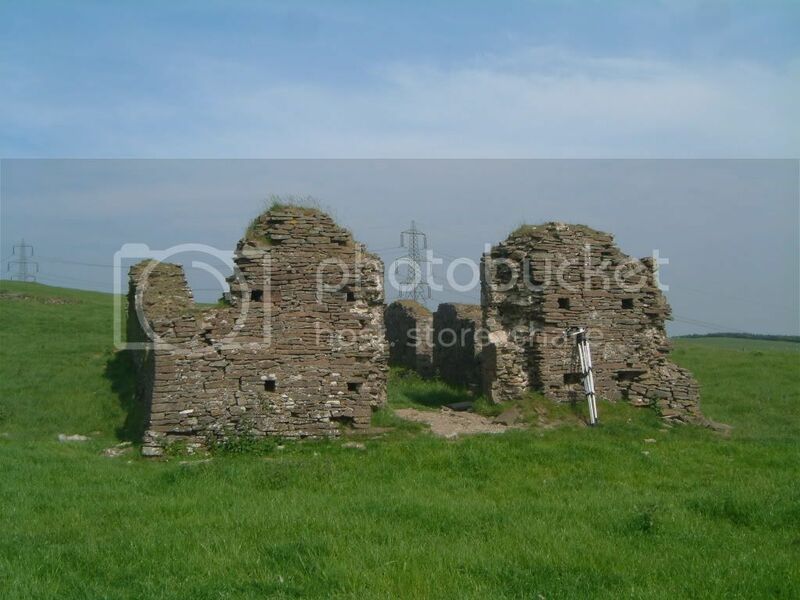 The mediaeval romance tales of the Greal Chapel requires that there should be a Greal Castle, and just north of St Peters are the ruins of the forgotten castle of Caer Caradoc. King Caradoc ap Arch fought the Romans from AD 42 to 51 and so his Castle is of the Apostolic era and of the time when Joseph of Arimathea brought the fleeing holy family from Judaea to Britain. Two hundred yards to the west of St Peters and Caer Caradoc the stream of Nant Ilid breaks out and runs down the northern slopes, and Nant Ilid is The Stream of Joseph. Nant Ilid arrives at Llan Ilid – the church f St Ilid. The ancient Triads name only one church twice as the most important in Britain and that is the church at Caer Caradoc. The Bruts record that the Prince Myrddyn Emrys and his mother were resident at Caer Caradoc and that they met with the ambassadors of the murderous drunkard Gwrtheyrn-Vortigern at St Peter’s church at Caer Caradoc around AD450. Earlier King Lleirwg –Luke rebuilt the church of St Peters on the Corne Hill around AD150–167. The stories of the secret burial of a very important person preserved in the Nennius Histories, and in the Life of St Illtyd give topographical and place names information which indisputably point towards the St Peters-super-Montem location. As Illtyd was a first cousin of King Arthur II son of Meurig the burial is contemporaneous. The much quoted Perlesvaux 1000 year old story of pilgrims travelling from Britanny to visit the grave of King Arthur also contains topographical evidence which again points indisputably at St Peters at Caer Caradoc. This is only a fraction of the evidence, which gradually accumulated once the location had been identified. Our suspicions that the church was of more than passing interest were reinforced when on exploring the ruins and the heaps of stones from the tumbled walls we discovered a large stone with the Latin REX, ARTORIVS FILI MAVRICIVS. The inscription was curious as at first it seems that it should read “Artorivs Rex” as King Arthur, but it reads as The King –Arthur son of Maurice. Again the “experts” shout that it should be Mavricii and not Mavricivs, but a Latin scholar says that in the Fifth declension the spelling of Mavricivs is correct. The Sixth Century AD son of King Meurig ap Tewdrig is copiously recorded in Glamorgan & Gwent records, and there is no question of his actual existence. That this king was regarded as The King emerged very clearly over the years of researching. This son of King Meurig is variously recorded as Arthmael –Iron Bear, and as Arthrwys, Attwys, Athrwys, Arthfael, and so on but always as the eldest son of the powerful King Meurig. The genealogies, the cathedral charters, the histories, and three other ancient Sixth Century AD Glamorgan stones bear his name. The Bruts of England very firmly state that King Arthur was crowned as King of Glamorgan, and in mediaeval times it is clear that everyone in England and Wales knew he was a Glamorgan-Gwent King. As for the stone we have mention of a stone in both the Nennius History and the Life of St Illtyd, and a statement that the stone was taken to the church., and also a curious reference in a Sixth Century poem to an un-named dead Uthyrpendragon states that “Your stone there was became a mystery”, whilst a 12th century Norman-English historian also refers to a stone. As King Tewdrig the grandfather of Arthur II has been excavated twice in his stone coffin in 1609 and in 1881, and King Meurig the father of Arthur II, is recorded as lying in a tomb inside the Giant Circle at Caer Caradoc where a great tomb mound still stands, and as King Morgan the successor of Arthur II is recorded as being buried in the mound named Bedd (grave of) Morgan Mwynfawr, the only King missing in this era is Arthur II. It appeared logical to us that as Egyptian Pharoahs were buried in Egypt, and as Chinese and Japanese Emperors were buried in China and Japan, then the Kings of Glamorgan would be buried in Glamorgan. Even the English Bruts record Arthur as a crowned Glamorgan King, and Glastonbury in Somerset, which was founded in AD 941 and Dunstan became its first Abbot in 942, began to emerge ever more clearly as the political and religious fake and fraud it has always been. Troubles, which had begun as early as 1981 when we first bought St Peters, had escalated over the years into a full scale organized campaign of vilification against us. We have never ever heard of anything to parallel the criminal outrages and illegalities practised against us.In late 1989 the English staffed CADW, a marketing organization set up to advertise those few ancient sites in Wales owned by the government- issued a press release which claimed that St Peters-super-Montem was a 12th century AD Norman creation. This despite the obvious presence of the windows styled as Early English and therefore of the AD 650 – 750 period. This would effectively mean that all ancient Welsh records and histories were totally worthless. The Triads would wrong and worthless, so also would the histories as Myddyn Emrys could not have met with Vortigern’s ambassadors in a non existent church, etc, the ancient Welsh epic poetry would wrong and worthless, The Royal Genealogies and the ancient Cathedral and Abbey Charters would be worthless, and of course the contemporary documents in the shape of Sixth centurry inscribed stones would be useless, and so on. At a stroke CADW was attempting to discredit not only our well founded and detailed researches but also to destroy the entire History of the nation. In 1990 in order to prove that the church was, as we believed and as the records stated, founded in the 1st century AD, and it was not a Norman creation of well over a millennium later, we were compelled to organize an archaeological excavation. This was an awesome prospect as archaeology is a prohibitively expensive business and all our enterprises were self-funded. We made application to the Royal Commission for Ancient Monuments in Wales for permission to excavate our own property of St Peters-super-Montem. Normally permissions are granted within days, and the rules clearly provide for maximum period of seven weeks for a Yes or NO to be given. We however were marked men and targets for attack and it took twenty-four weeks and much acrimony to force bureaucrats to obey the law. In fact they broke the law by delaying matters for 24 weeks. When in 1990 we applied to excavate, our own legally owned property of, St Peters super Montem church, the regulations require that permission to excavate is either granted within seven weeks by the Royal Commission for Ancient Monuments in Wales or it is otherwise refused. The “authorities” in Wales acted in complete disregard and breach of the regulations and took 24 weeks. We had two angry meetings with the Junior Minister of the Welsh Office, and several other exchanges in other forums before they reluctantly got off their backsides and obeyed the law. The difficulties raised and the acrimony and the later tirade of published and spoken distortions and false accusations levelled at us have left their mark. We are indeed concerned at having to approach these little Nazis to seek to complete the task to legitimately explore what was deliberately thwarted and prevented in 1990. The illegal obstructions in 1990 forced the excavations into the winter instead of them taking place in one of the best spring and summers ever recorded. There was a storm with gale force winds reaching 100 miles an hour and within the next two weeks two 70 miles an hour gales smashed the whole excavation. We are thinking of how we might deal with the potential illegal obstructions, which will inevitably be placed in our way by crooks in Wales. We suggest that we write up the situation as it is now clearly known, and that we endeavour to put is out as a magazine or newspaper article. In other words we expose the 1990 conspiracy by various “authorities” in Wales before the have an opportunity to their inevitable repeat the dirty tricks campaign. The capacity of the various Welsh “authorities” and government bodies to totally ignore the Law, and any rules and regulations, to assist their grant-hogging friends is legendary. So we need to let the Public at large know exactly what our difficulties are in exercising our Basic Human Rights in Quango Land. The Need to Excavate St Peters Super Montem Church. The excavations of St Peters in 1990 were brought to a premature end because of the onset of very bad weather in September. Permission to excavate had been sought in the beginning of March 1990 and permission to dig should have been granted by the end of April at latest. Dirty tricks resulted in permission being delayed for 24 weeks until 24th August 1990. It was discovered that the church was first built in the Ist Century AD. It was later successively rebuilt four times over the ensuing centuries. This meant that the first small church was built at the West end of the site and as it was successively enlarged the structure advanced up a slope. This meant that whereas the West end floor was around one foot above the bedrock this floor level was continually raised as the East end expansions moved up the slope. The final structure resulted in the chancel at the East end of the church had a floor level just over one foot above bedrock and the West end floor was some four feet and more above the bedrock. Excavations were carried out to these levels. At the North West corner of the chancel was something very strange. There were two large flat identical well-cut stones. These stones were completely unmarked and resembled a pair of double doors. When these two stones were raised there was something very peculiar beneath as it was clearly apparent that there was an area of around five feet by five feet of light coloured lightweight soil, which was completely different from the darker heavier soil natural to the whole of the rest of the church. The junior archaeologist on site began to carefully excavate this strange pit, and it soon became apparent that this was a shaft, which penetrated deep into the bedrock. Whereas the whole of the remaining area of the dark soil inside the church had been full of debris in the form of skulls, bones, bits of coffin parts, rotting shrouds, and so on, the lighter sandy soil in this shaft was clean and entirely clear of all debris. The shaft was excavated down to over five feet and this was a somewhat difficult task as a massive section of the North wall of the church alongside the shaft has a decided lean inwards over the shaft. We shored up his leaning wall by using very heavy timbers. At this stage the first and worst storm hit the excavation site, which is some 950 feet up on an exposed mountainside, and 100 miles an hour winds wrecked the site. The shaft area was considered dangerous and so work was stopped. Alan Wilson and Peter Sunman went into the shaft, which was now excavated down to around four feet below the surrounding bedrock levels and over five feet below floor levels. They used thin steel rods and a mallet to probe down further into the shaft. 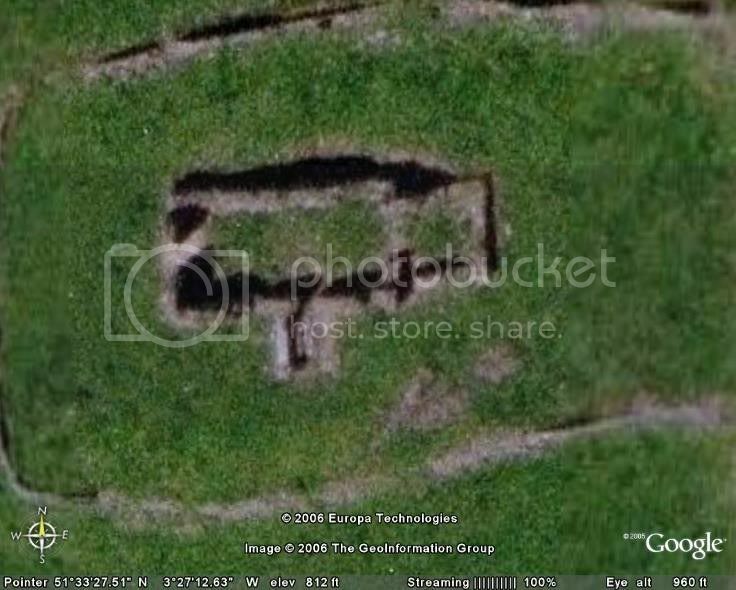 They found that there was a level area around three feet further down and this appeared to be a level stone area, which gave a hollow resounding sound. It was apparent that this 5 x 5 foot wide shaft was an entry to a crypt, and that just as in other excavations in many countries (notably the tomb of Tutankhamun) the shaft had been filled in after the crypt had been sealed. The two “double door” slabs at the North West corner of the chancel were closure and the point of entry. The reason for importing the lightweight sandy soil was apparent as it was necessary to lighten the weight over the top of the entry to a crypt. In the ensuing weeks two further great storms hit the site and incessant rain forced the excavations to an end. If the permission to excavate had not been deliberately and illegally obstructed by the Royal Commission or Ancient Monuments in Wales and others who had no business whatsoever to be involved in our application, then this work of properly conducted excavation could have been completed and the shaft and crypt opened. The matter is one of great importance as the church always had a roof down through the centuries. When it was abandoned in the mid 19th Century a local farmer stole the stone roof. Subsequently stone robbing has continued right up to the present time. The absence of a roof means that rain water now directly penetrates the soil and must be seeping down to the crypt. This then means that whatever is in the crypt may become damaged. 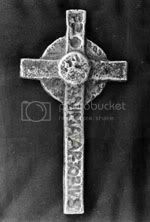 During the course of the 1990 excavations at St Peters a metal cross was found in the area where a Sixth century beehive hermitage had been erected at the east of the earlier church following the destruction of the church in the devastations of Britain by cometary debris in c AD 562. As expected this discovery has been the target of yet another widespread campaign of incredible lies, which would shame even Baron Munchausen. Generally the libels and slanders allege that the cross is made of lead and it is easily possible to make it on a kitchen stove. Worse still the allegations are that we made it in this manner. The Researches which are involved in this matter of this 1st Century AD St Peter’s church are Arthurian in that in one Section of a wide ranging set of Projects they examine in detail the careers of Arthur I son of Magnus Maximus and his first wife Ceindrech, and also Arthur II son of King Meurig and Queen Onbrawst. The second Arthur was born c 503 and died c.579. His grave was found in 1994, and subsequently proven, but as a direct result of the ongoing dirty tricks campaigns we have not announced or published on this vulnerable site. The situation emerging is that the mediaeval Arthurian Romances were coded stories, which were based upon basic truths. If there was a Greal Chapel as fondly recorded in Arthurian Tales then everything appears to point towards St Peters as the place. There is a great “lost” castle just to the north, which fits with the Greal Castle and so on. This may sound somewhat romantic rather than historical, but the 90 % of the astonishing historical discoveries, which we have not yet published, all point towards the records being remarkably accurate, and the later romance stories were based upon this authenticity. In romance tales, the end of the Greal is portrayed as the object being carried in and through the Greal Chapel and on into the chancel area where it then vanishes and it never seen again. The entry to the crypt is in the chancel area and out of sight from the main body of the church. In 2003 Alan Wilson and Baram Blackett invited Alan Hassell to visit St Peters ruins and to carry out a preliminary examination with his Pulse Star metal detector. The machine used by Alan Hassell can detect metal objects down to 30 feet below the surface of the ground. The result was extraordinary as Alan Hassell obtained metal readings in areas, which had been dug down to the bedrock levels. Therefore these metal readings would appear to be from objects deeper down under the bedrock, and this indicates that there is a crypt as the shaft in the chancel found in 1990 clearly illustrates. This metal detection examination made by Alan Hassell was filmed by NRG Films, and therefore an authentic record, made with witnesses present, is available. The next move is to carry out further non-intrusive examination by using ground penetrating radar equipment, which will map out cavities below ground and bring any results achieved together with a further non intrusive metal detecting exercise by Alan Hassell. In 1990 a six foot post and wire fence was erected around the church yard and a strong steel gate was placed at the West end. This fence and gate has now been completely removed by a person unknown, and cattle are now further damaging what is left of this the oldest Christian church in Western Europe. The Royal Commission for Ancient Monuments in Wales has predictably done nothing to remonstrate against the farmer who has removed the fences and allows his cattle to continue to damage the remaining fabric of the church. We have a very ancient church ruin, which the Triads proclaim as the most important church in Britain. The deliberately hampered and obstructed excavations of 1990 proved this to be correct. There were important finds made at the church in 1990. There is clearly a previously unknown crypt underneath the church and the place of entry to the crypt is established. The owners of the church have the Human Right to have their property properly examined and they have the right to enter the crypt of their Greal Chapel church, which is their property. It remains to be seen if the organized obstructions of 1990 are repeated in Wales. What is down there in the crypt is something that we have yet to discover. The sheer antiquity and ancient importance of the site makes it imperative that some effort must be made to discover what may be there. That this is the outstanding candidate to be the Greal Chapel would appear to be beyond doubt. That there was a place of religion, which became the Greal Chapel of the Romances and Legends, appears to be certain. At this time of writing we have no less than four major Libel actions launched against divers persons and organizations in South Wales. Although we escaped from Wales in September 1997 the persistent campaign of vilification and character assassination against us has continued unabated, but finally we have more than sufficient evidence to act against at least some of our persecutors. There is no need for us to catalogue here the organized series of vicious crimes, which were perpetrated against us for over twenty years. These crimes are fully set our on our Internet Sites under the section The Assassination of the King Arthur Projects. The worst crimes committed against us were those deliberately committed by the South Wales Police whose criminality and participation in the disgusting campaigns against us, and the manipulation of the Courts, would have led to an international outcry were they to have been perpetrated in any other country. It is high time that the incompetant Mr Burden the useless Chief Constable was brought to book.